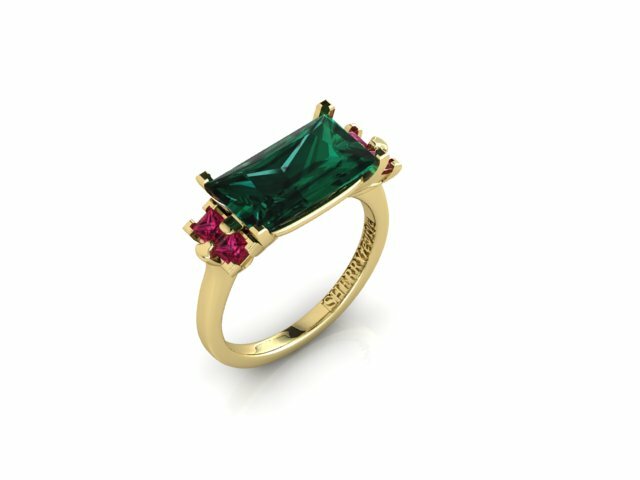 Green tourmaline and ruby ring A Sherry Revive ring remodel, from old jewellery. This ring was designed and created using component parts from many different pieces of jewellery. Our client wanted to have a bespoke ring, that would be completely unique to her. From the jewellery that was presented to us, we chose to combine the dark, bottle green of this big tourmaline, with the rich pink of 4 Burmese rubies. These shades are directly complimentary, which make them look very strong together. We set the stones with claws, in a cradle shaped design. Of course, we created our Sherryrevive logo inside the shank, to show it is a unique and original re-model by Sherry Jewellery. Reviving old jewellery into new.